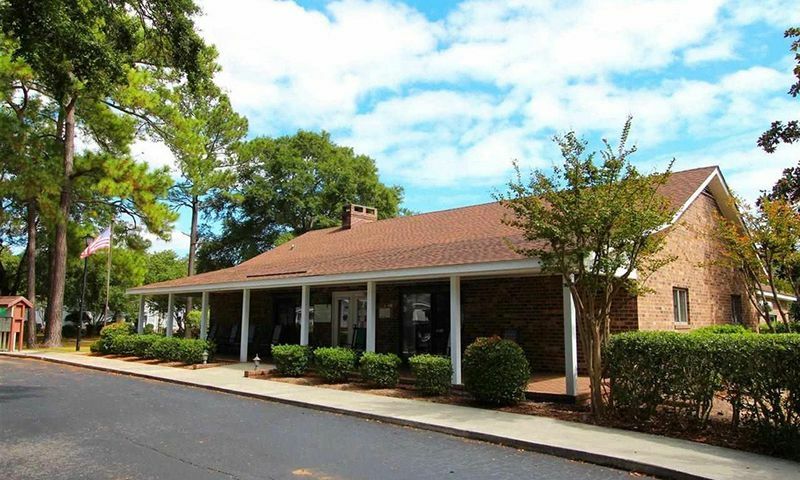 Live Oak is a 55+ community located in the beautiful Myrtle Beach area of South Carolina. This active adult neighborhood consists of 68 detached residences, which makes this a warm and friendly environment for Baby Boomers and retirees. Live Oak provides charming amenities at the community's clubhouse where residents gather for events and other social functions. Not only do homeowners have great amenities but they also have affordable low-maintenance ranch homes. Residents living in Live Oak enjoy its prime location in Murrells Inlet that's close to everyday conveniences. This age-restricted community is also just minutes away from the ocean and beaches, as well as plenty of shopping and attractions throughout the Myrtle Beach area. The clubhouse in Live Oak is the central gathering point where homeowners come together to have fun. Indoor amenities include a dining room where residents attend large parties and events in a fun atmosphere. A catering kitchen is on hand to prepare snacks for a community function. Neighbors can have fun at the card tables or enjoy a soak in the indoor spa. Live Oak's outdoor amenities are sure to keep residents busy as well. The swimming pool is great for laps or water workouts. Homeowners can relax on the patio to get some fresh air and sun. A bocce ball and tennis court are perfect for residents who want more physical activity. Live Oak was developed between 1984 and 1995 and consists of just 68 single-family homes. Homebuyers can choose from a variety of resale single-family homes in Live Oak. These detached residences offer approximately 1,272 to 1,800 square feet of living space. They have two or three bedrooms, two bathrooms, and a carport. These homes typically feature open layouts, one-story living, vaulted ceilings with ceiling fans, walk-in closets, a gas fireplace, and large covered porch. Residents enjoy a maintenance-free lifestyle in Live Oak thanks to an established homeowners' association (HOA). A reasonable HOA fee provides lawn care, exterior home maintenance, and access to recreational facilities. Live Oak promotes a social lifestyle that all residents can enjoy. The small community setting allows for neighbors to share similar interests and become fast friends. They can participate in community dinners, play tennis or bocce ball, or have fun with card games. Thanks to the HOA taking care of tedious exterior home chores, residents have more time to pursue hobbies at their leisure. Ideally situated in Murrells Inlet, SC, Live Oak is close to Highway 17, which makes driving around town easy. Just a few minutes away is Lee's Farmers Market that has fresh, local produce and other groceries. Residents can shop at Inlet Square Mall and there are plenty of restaurants and medical facilities nearby as well. Nature lovers can drive to Brookgreen Gardens or Huntington State Park for outdoor recreation. Myrtle Beach is 30 minutes away for additional entertainment, shopping, attractions and has an international airport for when traveling farther is necessary. Live Oak is a charming 55+ community with affordable low-maintenance homes located in an attractive area within Coastal South Carolina. There are plenty of activities available in Live Oak. Here is a sample of some of the clubs, activities and classes offered here. Homebuyers can choose from a variety of resale single-family homes in Live Oak. These detached residences offer approximately 1,272 to 1,800 square feet. They have two or three bedrooms, two bathrooms, and a carport. These homes feature open layouts, vaulted ceilings with ceiling fans, walk-in closets, a gas fireplace, and a large covered porch. Please Note: Floor plans are not available at this time. 55places.com is not affiliated with the developer(s) or homeowners association of Live Oak. The information you submit is distributed to a 55places.com Partner Agent, who is a licensed real estate agent. The information regarding Live Oak has not been verified or approved by the developer or homeowners association. Please verify all information prior to purchasing. 55places.com is not responsible for any errors regarding the information displayed on this website.